Julián and Joaquín Azulay both feel more at home in water, than on land. But how did these two Argentinian brothers, who trained in architecture and business administration, become ‘cowboys of the sea’ – the filmmakers otherwise known as Gauchos del Mar? Their father was something of a surfing pioneer in Argentina in the 60’s, a legacy which was passed on to the brothers when they were given their first surfing lesson at just eight years old. This nostalgic connection appears in their films, which features 8mm and 16mm clips of the surfing scene in Argentina at the time. “Our parents took us to different places when we were young, and that was where exploration started. We have always been close to nature and the sea, which was our inspiration”. 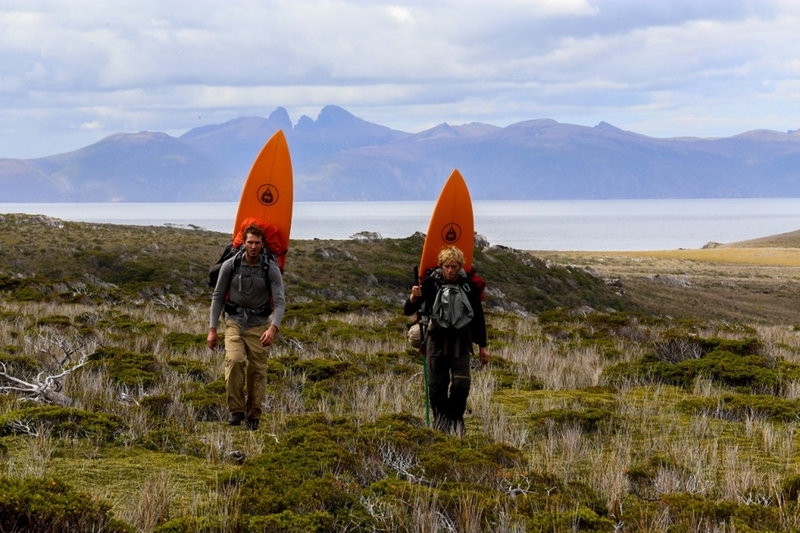 Just as surfing was passed to them as a legacy from their father, the brothers documented their first expedition so that they too can one day share those memories with their children and grandchildren. Julián trained as an architect and Joaquín used to play football, before studying business administration. “Education is really important for everything you do in life and prepares you for what’s coming. We both finished our studies and I am really grateful for that. It was part of our formation”. But in 2010, motivated by their passion for surfing, adventure and nature, Julián and Joaquín left 16 hour working days behind them to set off from California with the dream of surfing and camping their way down the Pacific coast and across the continent, back home to Argentina. “It was the start of a greater, lifelong journey”. Their first trip took 403 days across 30,000 kms and 13 countries, but it was the start of a greater, lifelong journey. Not only had they realised their dream, they had found their destiny as the ‘cowboys of the sea’, Gauchos del Mar. Did they ever dream they would make a career out of their natural desire for adventure? “We never thought we could make a career of it but people became interested in what we were doing and now, we are starting to produce our 5th film! We never imagined it but we made it work and with a lot of effort, anything is possible. Dreams are possible and that’s what we are trying to share. Surfing always gave us an excuse to go on an adventure, but we are also seeking new cultures, new friendships, to see the world, share our message and just enjoy life. There is a lot of effort and sacrifice, things are not always easy. You get out of your comfort zone. But even if we can’t have our favourite food or a hot bath, we’re doing what we love and that’s seeing the world a bit more”. An adventure, by nature, is unpredictable. Each turn affords new delights and new dangers. What keeps them going in harsh and extreme environments? “The final goal, the objective, becomes stronger than anything - we just get the motivation to keep going and overcome obstacles. Expeditions are not about winning, they’re about learning. That’s what keeps us going”. “Expeditions are not about winning, they’re about learning”. As much as you try, it’s not possible to be prepared for everything. For adventurers and explorers, the most important trait to have, is adaptability. “There’s a lot of preparation and logistics involved in our expeditions. We are as prepared as we can be but still, weird things happen!”. Gauchos del Mar are currently filming their latest project. Julián and Joaquín set off in a converted ambulance to explore and surf the entire perimeter of Africa in just two years. This is their most ambitious project yet, and not just because of the scale of it. “In Africa, a lot of weird things happen. We got trapped for 43 days behind a blockade by IS group Boko Haram. We couldn’t continue north because the border was closed. Those things you cannot control, those variables are external so you just need to adapt and overpass them in order to keep going, it’s all part of the adventure”. “Improvising is the last tool we apply, because when you improvise, you don’t have any other options. But in order to keep going, we had to do something, so we put the truck on a cargo boat and, well, it almost sank. Times like that you have to control your head and manage the stress. There were only four of us so we made the best out of the situation and we kept going”. Did they ever doubt they would make it out alive? “Things got pretty hectic. We couldn’t control anything because of what was going on around us. There was a lot of stress but in the end, everything worked out well”. Joaquín is keeping the details of what happened close to his chest prior to the release of their next film in late 2018/early 2019. But he did tell us that they spent 35 days living in a church which not only gave them shelter, it gave them comfort. It takes an incredible strength of mind to overcome some of challenges which Gauchos del Mar have faced on their expeditions. Food is often scarce, making them physically weak. Inhospitable and unpredictable environments often impede and increase their journey. In Patagonia, care packages were dropped by helicopter along their proposed routes, while they disappeared into the wilderness for months on end, carrying little more than tents, wetsuits and, of course, their surfboard on their backs. Julien almost broke his knee and suffered severe injuries during an unfortunate accident. When you’re exploring undiscovered territories, with no communication or infrastructure whatsoever, the only help you have, is each other (unless, of course, you’re on a Luxpedition). Have they ever reached their limits? “You don’t know your whole limits and capacities until you have these situations going on. Your limit is when you quit an expedition, so I think we still didn’t reach ours yet!”. There is a saying in Argentina, “El pasto de vecino siempre es más verde”. Joaquín describes it as “living the simpler life, being happy with what you have and not trying to see the grass of your neighbour”. ‘The grass is always greener on the other side of the fence’ is a sentiment that many people feel, but very few do anything about. The brothers realised that city life is an option, but it’s not the only one. On film, they present a life of simplicity, freedom, passion and brotherhood. “Your limit is when you quit… so I think we still didn’t reach ours yet!”. Each film tells a story through its different cultures, cuisines, people, animals and landscapes. As surfers, it goes without saying that ocean conservation is high on the agenda. Spending day after day in polluted waters would not only be unpleasant, it would lead to illness. As the largest ecosystem on earth, the ocean generates 50% of the oxygen we breathe, so it deserves our respect. “Conservation is really important” says Julián. That message didn’t fully hit home until the brothers spent 53 days living in the wilderness of Peninsula Mitre. “It’s an amazing place and why should that place be broken by men. Those places are wild and they should stay that way, why go constructing a road or taking resources? The world has its limits. It should be important to maintain and conserve this wild place for future generations, and this is what our film stands for”. But it’s not just environmental awareness that’s on the agenda. “We know that people are starving in the world, we all know it and we just look the other way. You, me, everyone is part of the misery. That’s one of the messages of our next film. You will see strong images of people having a really bad time, but we are all part of it so maybe we can highlight that and try to make a difference”. So what’s next for Gauchos del Mar (after Africa)? “There are still so many places to see. The Pacific Islands, Micronesia, Polynesia, the Philippines too. The world is so big. Russia and the arctic/Antarctica are also high on our list”. And what do they look forward to most when they get back home? “We miss eating meat a lot! Because we only have limited space inside the truck and we don’t have a fridge, it’s hard to store fresh meat and vegetables. In our culture in Argentina we eat a lot of meat, so we miss milanesa and asado”. Julián and Joaquín have formed an unbreakable bond, not only with each other, but with nature. Through their films, they share their philosophy of simple living, in harmony with nature. As Joaquín says, “Enjoy the Journey. Leave Nothing Behind”. Even without subtitles, the sound of the wind, water and birds echoing across some of the last remaining virgin landscapes on Earth, is a stirring reminder of the connection we have to our planet. You can watch Julián and Joaquín follow their dreams to the ends of the Earth, in one of their award-winning films. We can make it achievable for you too. Inspired by their adventures? If you want to journey through the virgin lands of Patagonia, instead of trekking 400km in 53 days like Gauchos del Mar, let us fly you in with them by helicopter on your own bespoke Luxpedition (oversized windows with unimpeded views and noise-cancelling headsets included as standard). They will introduce you to this undiscovered corner of the world in all its untamed beauty. You can then explore this raw landscape however you desire. Camp, fish, hike or surf the wild waters – all in the knowledge that your private helicopter will be ready to fly you back, if and when you tire of this breathtakingly untouched wilderness. If you’ve got some spare time, perhaps stop by to see the Emperor Penguins in Antarctica on your way home. To create the Luxpedition of your dreams, get in touch.